Own Angelina Ballerina - Ballerina Princess DVD from Deff, DVD, Blu-Ray & 4K Video Specialists - Free UK Delivery.. Pop Star Girls: Get into the groove with Angelina and the pop star girls! While all the dancers learn to work together, Angelina realises she loves Hip Hop, rock bands, fiddles and more! Move and groove along with Angelina as she directs a Hip Hop musical and discovers she was born to be a star. The whole family will be star-struck with delight as Angelina steps it up in her best performance yet! Ballerina Princess: Join Angelina Balle..
Own Angelina Ballerina - Its Showtime! DVD from Deff, DVD, Blu-Ray & 4K Video Specialists - Free UK Delivery..
Angelina Ballerina has just moved house and is about to start her new school - Camembert Academy. With exciting new friends, new forms of dance to explore and lots of fun things to do, it's a thrilling new adventure! Join Angelina in her brilliant new all-singing, all-dancing animated series, The Next Steps! Featuring three stupendous songs!.. 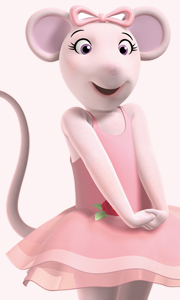 Own Angelina Ballerina - Mouse Of The Year DVD from Deff, DVD, Blu-Ray & 4K Video Specialists - Free UK Delivery..
Own Angelina Ballerina - Mouseling Mysteries DVD from Deff, DVD, Blu-Ray & 4K Video Specialists - Free UK Delivery..
Own Angelina Ballerina - Musical Moves DVD from Deff, DVD, Blu-Ray & 4K Video Specialists - Free UK Delivery..
Own Angelina Ballerina - Pop Star Dreams DVD from Deff, DVD, Blu-Ray & 4K Video Specialists - Free UK Delivery..
Own Angelina Ballerina - Princess Dance DVD from Deff, DVD, Blu-Ray & 4K Video Specialists - Free UK Delivery..
Own Angelina Ballerina - Spring Fling DVD from Deff, DVD, Blu-Ray & 4K Video Specialists - Free UK Delivery..
Superstar Sisters: Will Princess Polly be able to forgive her sister when Angelina breaks her special music box? Angelina's sisterly instincts kick in when Polly goes missing, and Polly proves she can be a big inspiration to help Angelina finish Ms. Mimi's important assignment. Musical Moves: Gracie loses herself to some disco grooves while Alice discovers the power of confidence through jazz! AJ hip-hops to a birthday beat, and Ms. Mim..
Own Angelina Ballerina - Superstar Sisters DVD from Deff, DVD, Blu-Ray & 4K Video Specialists - Free UK Delivery..
Own Angelina Ballerina - Sweet Valentine DVD from Deff, DVD, Blu-Ray & 4K Video Specialists - Free UK Delivery..
Own Angelina Ballerina - The Ice Ballet DVD from Deff, DVD, Blu-Ray & 4K Video Specialists - Free UK Delivery..
Own Angelina Ballerina - The Nutcracker Sweet DVD from Deff, DVD, Blu-Ray & 4K Video Specialists - Free UK Delivery..
Own Angelina Ballerina - The Shining Star Trophy DVD from Deff, DVD, Blu-Ray & 4K Video Specialists - Free UK Delivery..
Own Angelina Ballerina - Twirls & Twists DVD from Deff, DVD, Blu-Ray & 4K Video Specialists - Free UK Delivery..